Ch. 10: Fallout Radiation Meters - Nuclear War Survival Skills, Free 280 pg Book On-Line! Anti-Radiation Pill FAQ! Potassium Iodide (Iodine) OTC Sources, Radiation Protection Info! Get Hard Copy of NWSS 260 page book Here! compared for Potassium Iodide (KI), Potasium Iodate (KIO3), and all forms of radiation protecting iodine! Trans-Pacific Fallout Here From Overseas Nukes! A survivor in a shelter that does not have a dependable meter to measure fallout radiation or that has one but lacks someone who knows how to use it will face a prolonged nightmare of uncertainties. Human beings cannot feel, smell, taste, hear, or see fallout radiation. A heavy attack would put most radio stations off the air, due to the effects of electromagnetic pulse, blast, fire, or fallout from explosions. Because fallout intensities often vary greatly over short distances, those stations still broadcasting would rarely be able to give reliable information concerning the constantly changing radiation dangers around a survivor's shelter. The dose (the quantity) of radiation that a person receives, along with the length of time during which the dose is received, determine what injuries, if any, will be suffered as a result of the dose. Of people who, in a few days, each receive a dose of 350 roentgens under nuclear war conditions, about half will die. Doses are measured with small instruments called dosimeters, either by directly reading the dose between the time at which a dosimeter is charged to read zero and the time of a subsequent reading, or by calculating by subtraction the dose between two readings. However, to avoid receiving a lethal or sickening dose, the most useful instrument is a dose rate meter. The National Academy of Sciences' Advisory Committee on Civil Defense in 1953 concluded: "The final effectiveness of shelter depends upon the occupants of any shelter having simple, rugged, and reliable dose rate meters to measure the fallout dose rate outside the shelter." With a reliable dose rate meter you can quite quickly determine how great the radiation dangers are in different places, and then promptly act to reduce your exposure to these unseen, unfelt dangers. For example, if you go outside an excellent fallout shelter and learn by reading your dose rate meter that you are being exposed to 30 R/hr, you know that if you stay there for one hour you will receive a dose of 30 R. But if you go back inside your excellent shelter after 2 minutes, then while outside you will have received a dose of only 1 R.
(2 minutes 2/60 of an hour = 1/30 hr; and receiving a dose at the rate of 30 R/hr for 1/30 hr results in a dose of 30 R/hr x 1/30 hr = 1 R.) Under nuclear war conditions, receiving an occasional dose of 1 R (1,000 milliroentgens) would be of little concern, as explained in Chapter 13 and 18. ° No U.S. Government agency or other Government facility advises the public regarding sources of the best available radiation-measuring instruments for use in time of war, or warns concerned individuals that certain instruments are either incapable of measuring adequately high dose rates or doses for wartime use, or are dangerously inaccurate. For example, a dose rate meter that in 1982 sold nationwide was tested in that year at Oak Ridge National Laboratory to determine its accuracy for measuring gamma radiation. This instrument was reasonably accurate at low dose rates, but at the high dose rates of life or death importance in a nuclear war its readings were dangerously low: When it should have read 150 R/hr, it read 13.9 R/hr. Another dose rate meter of this same model, tested in California by Dr. Bruce Clayton, read only 16 R/hr when it should have read 400 R/hr. Obviously, if this model were used and trusted by a person doing rescue work for hours outdoors in heavy fallout, while believing that he was receiving a non-incapacitating dose he actually would be getting a fatal dose! ° Instruments that measure only milliroentgen-range dose rates are sold for war use by some companies. Since most Americans have no idea what size of radiation doses would incapacitate or kill them, and do not even know that a milliroentgen is 1/1000 of a roentgen, some people buy instruments that are capable of measuring maximum dose rates of only one roentgen or less per hour. For example, an American company advertised and sold for $370.00 in 1986 its dose rate meter that has a maximum range of "0 1000 mR/hr." It is the only dose rate meter in that company's listing of "Radiation Detection Products for the General Public", described as.... , applicable for use in case of nuclear war." The highest dose rate that it can measure, one roentgen per hour, is far too low to be of much use in a nuclear war. ° Used and surplus dose rate meters and dosimeters are likely to be inaccurate or otherwise unreliable. Very few buyers have access to a radiation source powerful enough to check instruments for accuracy over their full ranges of measurements. My education regarding bargain fallout meters began in 1961, after I bought two dosimeters of a model then being produced by a leading manufacturing company and purchased in quantity by the Office of Civil Defense. Within a week after receiving these instruments, one of them could not be charged. The other was found to be inaccurate. Later I learned that the manufacturing company sold to the public its instruments that did not pass Government quality tests. Most Federal and State organizations do not criticize faulty civil defense products, apparently because they are not charged with this responsibility and want to avoid angering manufacturers and sellers who may go to their Congressmen or Legislators to seek redress for lost sales. In this book I am not giving the names of any of the companies that sell or have sold potentially life-endangering survival items. To do so would reduce the chances of this book being distributed or advocated by Government agencies. One of Americans' most important assets for surviving a nuclear war is the Federal Emergency Management Agency's (FEMA's) supply of fallout meters. These instruments include approximately 600,000 dose rate meters and about 3,300,000 dosimeters, all suitable for wartime use. In 1986 almost all of these old instruments-that can be found-reportedly still are in good working condition. Because of continuing inadequate funding for civil defense, in recent years most of FEMA's instruments have been serviced, calibrated, and, if necessary, repaired only once every four years. In a few localities these instruments are no longer being serviced. Most of these critically important instruments are kept in cities, in buildings likely to be destroyed by blast or fire in the event of a massive Soviet attack. If there were a sufficiently long, officially recognized period of warning before an attack, it might be possible during such a worsening crisis to move a large fraction of these fallout meters outside the areas of probable blast or fire damage, and to place them in officially designated fallout shelters. However, this unlikely development would not provide private family shelters with instruments. Most families need their own fallout meters. This need is greatest for families living in localities not likely to be damaged by blast or fire, and for those planning to evacuate to such less hazardous localities during a worsening crisis. In 1987 an American does not have many choices if he wants to buy an off-the-shelf dose rate meter suitable for measuring the high levels of fallout radiation that would result from a nuclear attack. Although inexpensive dose rate meters and dosimeters have been under development by the military services and civil defense researchers for the past 15 years, they have not been produced commercially for sale to the public. Field tests of factory-produced models have not been completed at this writing. A less expensive dose rate meter designed for rugged wartime use is the Portable Radiological Dose Rate Meter PDRM 82, manufactured in England by Plessey Controls Limited, Sopers Lane. Poole, Dorset BH17 7ER, England. This instrument is the current standard issue of the British armed forces and civil defense, is designed for a storage life of at least 20 years, is microcomputer controlled, EMP-proof, and displays "FAIL" if a fault exists. (Like all instruments, occasionally a PDRM 82 does fail. One bought by a friend in 1987 and tested by a radiation laboratory in Utah read 86 centigrays per hour when it should have read 300, and failed to display "FAIL.' Mailed back to England, Plessey Controls finally replaced it with another new PDRM 82.) The only consequential disadvantages of the PDRM 82, compared to more expensive dose rate meters, are that it reads in centigrays per hour (cGy/hr is equivalent to Rads/hr, or R/hr) and does not measure dose rates lower than 0.1 cGy/hr (100 mR/hr). In 1987 this portable, four-digit-liquid-display dose rate meter is sold by Plessey Controls for 250 British pounds plus air shipment charges - all pre-paid. To learn the latest delivery date and the latest price delivered direct by air, write Plessey Controls. No wonder that most newspaper and television accounts of radiation accidents and hazards are confused! I have not been able to find an American- made, modern dose rate meter that is designed for wartime use and is being sold in 1987. Among those designed for peacetime use that may be satisfactory in wartime is the RO-2A manufactured by Eberline, P.O. Box 2108, Santa Fe, New Mexico 87504-2108. The RO-2A is a portable air ionization-chamber instrument used to measure beta, gamma, and X-ray radiation from 50 mR/hr to 50 R/hr. The price in 1987 is $950.00. In Eberline's summary specifications and in the specifications that I have read of other U.S. manufacturers of dose rate meters, no mention is made of the instruments' being EMP-proof. Several reliable dosimeters and dosimeterchargers are sold in the United States. Among the established retail sources is Dosimeter Corporation, P.O. Box 42377, Cincinnati, Ohio 45242. Its DCA Model No. 686 measures accumulated doses from 0 to 600 R, and in January of 1986 sold for $59.95. The battery powered charger, DCA Model No. 909, cost $90.00; one charger can be used to charge several dosimeters. A more expensive direct reading 600 R dosimeter is model 019-006 of Atomic Products Corporation, P.O. Box 1157, Center Moriches, New York 11934. It sells for $120.00; dosimeter charger 020-001, " . . . used to 'zero' all Direct- Reading Dosimeters", costs $98.00. The reader is advised to buy at least a good commercial dose rate meter, with which to quickly measure high levels of fallout radiation -if he can afford one. A family that has a reliable dose rate meter, and that remains in a shelter almost all of the time during which fallout dose rates outdoors are dangerously high, can calculate with sufficient accuracy the accumulated doses received by its members. To do this, a continuous record must be kept of dose rates and the times at which those measurements are made. (Having a reliable dosimeter eliminates the need for keeping such detailed records and making these calculations, but if only one instrument can be afforded it should be a dose rate meter.) A good commercial instrument, if properly maintained and periodically calibrated with a radiation source to check its accuracy, probably will be serviceable for years. A prudent owner of even an excellent dose rate meter would do well to make and learn to use a KFM, the dependable homemakeable fallout meter briefly described later in this chapter, with complete instructions for making and using it given in Appendix C. Then during a period of heavy war fallout you can check the readings of your complex instrument by comparing them with those of your KFM, and, if the complex instrument is giving inaccurate readings, your KFM will meet your basic need. KFM plans described below are at Appendix C, ALSO check out the KFM kit here! It has everything needed to make and use a radiation measuring device. Accurately measures dose rates from 30 mR/hr (0.03 R/hr) up to 43 R/hr. The KFM has undergone rigorous scientific testing in several laboratories where its accuracy and dependability were confirmed. Including Oak Ridge National Laboratory where it was developed by Cresson H. Kearny, author of Nuclear War Survival Skills. Designed to be assembled by a junior high age student, thousands of KFM's have been built worldwide. The kit comes with all the parts and very detailed construction, operating and testing instructions in 12 large pages covering Appendix C, plus extra info! The KFM kit also has some of the critical construction steps above completed for you. Also includes a free (non-working) smoke detector to use as a safe radioactive testing source. And, it does not require a battery. Great science project, too! Details of $55 KFM Kit (incl s/h) here! The only do-it-yourself fallout meter that is accurate and dependable was invented in 1977. It is called the KFM (Kearny Fallout Meter); one is pictured in Fig. 10.1. Fig. 10.1. A homemade KFM, an accurate dose rate meter for measuring dose rates from 30 mR/hr (0.03 R/hr) up to 43 R/hr. This simple instrument has undergone rigorous scientific testing in several laboratories, including Oak Ridge National Laboratory; its accuracy and dependability were confirmed. Many hundreds of KFMs have been made by untrained people, ranging from members of junior high school science classes to grandmothers making them for their children and grandchildren. These successful makers have been guided only by thoroughly field-tested instructions and patterns not quite as good as the improved ones given in Appendix C of this updated book. Only common materials found in millions of homes are needed to build a KFM. (If all of the materials, including those for a dry-bucket, have to be purchased, their total cost in 1986 is less than seventeen dollars.) The KFM serves as an accurate dose rate meter when used in conjunction with a watch and the KFM's attached table relating changes in readings in listed time intervals to dose rates. No radiation source is needed either to initially calibrate a KFM or subsequently to check its accuracy. (Calibrations for accuracy were completed at Oak Ridge National Laboratory and are the basis of the KFM's attached table.) A KFM is more accurate than most civil defense instruments, and its accuracy is permanently established by the laws of physics applicable to the specified dimensions and other characteristics of its parts, and to their positioning relative to each other- provided that it is made and maintained according to the instructions. Unlike all factory-made radiation measuring civil defense instruments that are reliable and available today, a KFM is charged electrostatically. No battery is needed. * A KFM combines the provenly practical radiation measuring functions of an electroscope and of an ionization chamber having a specified volume. Electroscopes were the basic radiation measuring instruments used by scientists, including Nobel Laureate Lord Rutherford, who pioneered studies of atomic nuclei and radiations. The author is indebted to another Nobel Laureate physicist, Dr. Luis W. Alvarez, for the idea of making a homemade electroscope with two thread-suspended, aluminum-foil leaves, to measure fallout radiation. Many excellent and unavoidably expensive dose rate meters, including civil defense instruments, are ionization chamber devices. * A KFM, used in conjunction with a watch, does not have to be charged to any specified initial reading, or discharged by exposure to radiation to any specified final reading, to accurately measure the dose rate during a time interval specified on its attached table. Fig. 10.2 illustrates this operational advantage of KFMs. Fig. 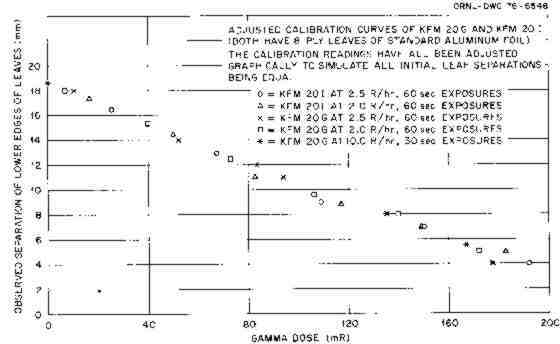 10.2 Normalized Calibration Points for Two KFMs, Showing the Straight-Line Relationship Between Milliroentgen Radiation DOSES and Resultant Readings. The complete instructions for making and using a KFM (see Appendix C) explain how an operator with a watch can use this instrument to accurately measure DOSE RATES. 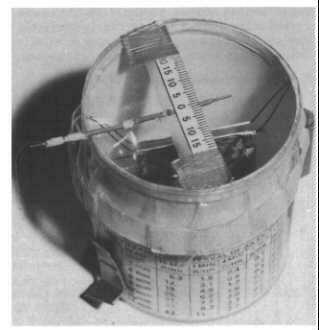 * Readers who want additional technical information on the KFM are advised to buy a copy of the original Oak Ridge National Laboratory report on this instrument, The KFM, A Homemade Yet Accurate and Dependable Fallout Meter (ORNL-5040, CORRECTED), by Cresson H. Kearny, Paul R. Barnes, Conrad V. Chester, and Margaret W. Cortner. Date published: January 1978. Copies are sold by the National Technical Information Service, U.S. Department of Commerce, 5285 Port Royal Road, Springfield, Virginia 22161. Since the price continues to increase, it is best to write first, to learn the postage-paid cost. * Civil defense professionals of foreign countries also have concluded that KFMs have lifesaving potential. The June 1978 Special Issue of The Journal of the Institute of Civil Defence ("The Premier Society of Disaster Studies", with headquarters in London) was entirely devoted to the KFM, and gave international distribution to the original complete instructions and cut-out paper patterns. The interest of Chinese civil defense officials in the KFM and my other low cost survival inventions led to my making, with White House approval, two long trips in China as an official guest. In eight Chinese cities I acquired survival know-how by exchanging civil defense information with top civil defense officials. * This instrument appears too simple to be trusted to measure deadly radiation, a frightening mystery to most people. Typical moderns are accustomed to pushing buttons and twisting dials to get information instantly from instruments they do not understand. Most feel that a dependable radiation-monitoring instrument has to be complex. However, especially during a worsening nuclear crisis many typical Americans would build KFMs if they become convinced of the accuracy and dependability of this homemakeable instrument that they can understand, use intelligently', and repair if necessary. Earlier versions of KFM-making instructions, written when common sewing threads were good insulators, recommend sewing threads for suspending a KFM's leaves. Now most sewing threads are anti-static treated, are poor insulators, and are unsatisfactory for use in KFMs. Makers of KFMs should use the instructions in this updated edition, that recommend widely available, excellent insulators for suspending a KFM's leaves, and that incorporate several field-tested design improvements. Appendix C gives the latest field-tested instructions (with patterns) to enable you to make a KFM and to learn how to use it. The great need for civil defense instruments is likely to be fully recognized only during a worsening nuclear crisis. Therefore, in this edition the KFM instructions and patterns are printed on only one side of a sheet, with extra patterns at the end of the text, and with two pages at the very end to expedite the rapid reproduction of the KFM instructions. Timed printing tests by two newspapers have proved that, with the help of these two pages of special instructions, a newspaper can paste up and photograph all pages of the KFM instructions, print a 12-page tabloid giving them, and start distributing the tabloid-all in less than one hour. Thus, if you have a copy of this book during an all-too-possible nuclear crisis, you may be able to give these instructions to a newspaper and help thousands of your fellow citizens obtain the information that they need to make fallout meters for themselves. The reader is urged to set aside several hours in the near future for making a KFM and for mastering its use. During field tests, average American families have needed about 6 hours to study the instructions given in Appendix C, to make this simple instrument, and to learn how to use it. These several hours may not be available in the midst of a crisis. Higher priority work would be the building of a high-protection factor shelter, the making of a shelter-ventilating pump, and the storing of adequate water, in a crisis it might not be possible to obtain some needed materials for a KFM. It is very difficult to concentrate on unfamiliar details during a nerve-racking crisis, or to do delicate work with hands that may become unsteady. The best time to build and learn to use a KFM is in peacetime, long before a crisis. Then this long-lasting instrument should be stored for possible future need. KFM plans described above are at Appendix C, ALSO check out the KFM kit here! for Potassium Iodide (KI), Potasium Iodate (KIO3), and all forms of radiation protecting iodine!